This list is useful for anyone who has given starting their own business the kind of attention they give other important life choices. That could be you, a friend, a family member or a co-worker. There’s no magical number of “steps” that you must take before you launch a business, yet we believe the “signs” below capture the kind of mindset and legwork you MUST do. 1) Do you feel a sense of purpose about your idea or service? Notice we did not use “passion.” A purposeful approach to the need you are fulfilling with your business or service is essential. Often, passion is not enough and it can blind you to the practicality and useful (or uselessness) of what you’re doing. 2) You’ve done your market research. You need to understand who your customers are, what they are buying, where and how they make purchases. What makes you better than someone else doing the same thing? Know whether your product or service is something that people will want to buy again and again, seasonally, or one time. Begin by researching pricing to stay competitive but if your product is substantially superior, it may warrant a higher price. 3) Plan: Business and Financial – do you have both done? Your business plan is not done solely to get funding from a bank or individuals, it is the physical embodiment of everything that has been running through your head and many things you hadn’t even considered until you started putting it together. A business plan is also a way to attract talent. If you are relying only on your stellar personality and assurances that “This is great, people will love it!”, it may not be enough. Financial plan: Here are a few methods, unconventional and mainstream. 4) You have support from friends or family. Let’s say you don’t have this. Why fight the inevitable? Look for new friends. Friends who show the same enthusiasm for life that you do. There’s no merit badge for maintaining friendships the longest. Quality matters. Period. Family is a bit stickier, we don’t get to choose them (unless it’s our spouses). Try to involve your spouse as much as possible, especially since financial realities will affect them too. Keep them abreast of where you are in terms of planning. Ultimately, if you’ve covered all your bases and have their input, their initial reluctance may wane. 5) You understand the risks. Know EXACTLY what you are selling, know WHETHER people will buy it, and know how you will FINANCE your operations. 6) You know what’s important to you. Some people value security and would never quit a stable job with benefits for the volatile life of an entrepreneur. These are personality traits that you MUST recognize before you start spending time and money on a potential business plan. We’re in the business of office space so we’d be remiss if we didn’t mention the disadvantages of working from home. We wish you the best in your endeavors, business related or not. And if you’d like to take a tour of our office space, drop us a line. According to Tynesha, her office space at Wall Street Conyers has helped her business grow. She says the professionalism and beauty of the office condominiums attracts new clients and has allowed her to bring on new staff. She recently welcomed a paralegal and intern to her office. In a recent blog article, we highlighted that Wall Street Conyers is situated among many growing industries, one of them being healthcare. In particular, Wall Street Conyers is home to 7 medical offices in just one building. One suite is still available in this desirable space so we thought we’d mention 4 businesses that would benefit from setting up shop here. Suite 290 at Wall Street Conyers is the perfect space to house a small to medium sized Dental practice. Our 2,360 RSF of renovated medical office space, a private bathroom and tile floors make this space very attractive to a new dental office or a branch of an existing practice. The global skin care industry is estimated to reach $121 billion in 2016. And by 2018, the U.S. skin care market will reach $10,717.4 million. You can enroll for a course in cosmetology and get trained on how to apply beauty care treatments. Dermatologists, cosmetologists and estheticians may also find the space appealing. There are many nearby businesses, including pharmaceutical companies and hospitals that would benefit from a drug testing facility. Did you know that 27.3% of Conyers residents are under the age of 18? Did you also know that Peachtree Academy, serving kindergarten through 12th grade is only .2 miles from Wall Street Conyers? Suite 290 is poised to house a pediatric doctor. Bonus: If you can schedule appointments for multiple family members, Wall Street Conyers can be a one stop shop for wellness. The Conyers-Rockdale area is diverse in both its demographics and its type of businesses, but healthcare and medical businesses will only continue to be in demand. The space is unfinished and a quality build out can be negotiated into the lease or purchase. This suite has a private unisex bathroom, tile floor in the foyer, a sink in the counter top, and great parking. There is elevator access and stairwell access. Call us today at 770-922-1090 to find out more and arrange a tour. Wall Street Conyers sits in the middle of a bustling medical community. Not only is WSC an ideal choice for a medical business, but it’s located right in the middle of the Rockdale and Newton County medical communities, which are growing by leaps and bounds. Two hospitals serve the community. 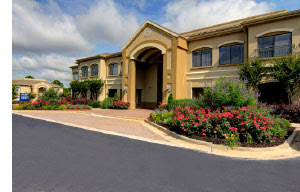 Rockdale Medical Center, part of LifePoint Health, is a leading hospital community in Conyers. On October 1, Newton Medical Center became part of the Piedmont Heath System, and is now called Piedmont Newton Hospital, becoming the sixth Piedmont hospital in the system. According to the hospital’s Chief of Staff, Dr. Carter Rogers, the change has been good for both the patients and the physicians. The hospital was founded over 60 years ago and has 97 beds. The Rockdale Physicians Office Association (RPOA) was founded to provide opportunities for continuing education and to promote the improvement of professional knowledge and skills by uniting medical offices and their staff through Rockdale County and the surrounding areas. Katie Beam, Marketing Director for Wall Street Conyers, is a member of this organization. Wall Street Conyers’ neighbors include Greystone OBGYN, Dr. Veronica Garrett, MD, Women’s Center PC (Dr. Stephanie Gordon), East Metro OBGYN, Dr. Thomas J. McElligot, MD – Orthopedic Surgery, Dentistry for Children, and Walton Pulmonary. Located at Wall Street Conyers is a host of medical offices including Conyers Family Chiropractic, Analia Home Healthcare, Integrating Body, Mind, and Life, AICA, C.H. Martin, Clear Speech, and Georgia Retina. Wall Street Conyers is a wonderful place to have your medical office or medical related business. Please contact Katie Beam at Service@WallStreetConyers.com for a tour of the available spaces. Wall Street Conyers knows office space. Our 4-building, 2-story, newly-renovated office community complex just 1 mile south of I-20 is close to restaurants, banking and shopping, with bright and modern spaces for our tenants and owners. However, not everyone is so lucky when it comes to office space. If any of these descriptions sound familiar, we can help. 1) Your staff has no personal space. They’re at each other’s throats, or at least giving each other stern looks. If your employees are too close to each other, they’re overhearing too many personal conversations, being annoyed by each other’s idiosyncrasies, and finding it difficult to concentrate, which is not good for them or your bottom line. This is even more crucial when your employees are performing highly technical work that involves concentration, like accounting. Not to mention those employees who spend ample time on the phone with customers and need to have a quiet environment. The conference room is only used as shared office space. At least one employee has gone off the handle and started yelling. Bonus: Wall Street Conyers has copious amounts of front door parking for all of your employees. When your hallways and break rooms are suddenly viewed as ‘new space’ options for employee workstations, filing rooms or equipment storage, you NEED more space. Sometimes management will pass off the lack of space by saying these close working conditions are meant to encourage teamwork and collaboration. Your employees are not buying it, especially if you have your own spacious office. At Wall Street Conyers, office spaces from 450 to 15,000 RSF (rentable square feet) are available for lease and purchase, so no matter what size you need, or will need in the future, we can accommodate you and your staff. There is zero storage and not enough equipment to go around to current staff, much less any desks or equipment to provide anything to a new employee. Forget hiring anyone new since you have nowhere to put them. Don’t let money be the main reason your employees lack space. Rental rates for small offices are available for as low as $650/month. Many available office suites can be combined to suit your present needs or your future expansion plans. Worried about lease terms? We recognize that life is full of surprises and we have flexible leasing options that provide you the ultimate in flexibility. Whether you’re looking for a permanent presence or a short-term lease, Wall Street Conyers will work with you. Contact Katie Beam at 770-922-1090 or email service@wallstreetconyers.com to discuss your new spacious office today! Problem: The florescent lights, staple to most offices, are sucking the life force from your employees. Solution: Survey the layout of your space and take stock of the physical arrangement. How can you keep the functionality and bring in more natural light? Start by opening the shades, blinds and curtains. Employees report getting headaches and experiencing fatigue from those terrible lights, so not only are you creating a more attractive environment, you are improving the health of your loyal staff. Be on the lookout for full-spectrum light bulbs which mimic natural light. Problem: Employee energy is low and when it comes time for lunch, employees dash out the door, to munch silently in front of their smartphones far away from the office. Solution: Plan a lunch and learn, but make it fun. Who doesn’t enjoy getting a free lunch and a chance to get together with others to learn something new? Consider asking a fitness coach, nutritionist, self-help consultant to speak. If you’re looking for experts, make sure to check your LinkedIn contacts, but give priority to the most dynamic speakers. Problem: There doesn’t seem to be enough camaraderie between your employees. Solution: Rather than have a happy hour, which is not the healthiest option, provide some kind of breakfast option one day a week. Bring in the “good” coffee, offer some delicious fruit, granola, and yogurt and get the day started off with shared “bread breaking.” People are more apt to connect when sharing a meal with one another. Problem: Long hours spent away from loved ones makes your employees grumpy. Solution: Allow the employee with the best behaved dog to bring them to work. In all seriousness, this one is dependent upon the type of business and of course, the flooring. But dogs lower our blood pressure and no one really wants their spouse at work, do they? These are just a few ideas to liven up your office. In the next few weeks, we’ll be sharing more. We’d also love to hear what your office does to spice up the workday. Wall Street Conyers provides the space and you provide the personality! Meet our featured tenant, Clear Speech, LLC, a speech therapy business located at 2395 Wall Street SE, Suite 190. The company has been providing services in the Conyers area since 2007, and expanded its business a year and one-half ago, needing additional space. Why did they move their offices to Wall Street Conyers? “After hearing about Wall Street Conyers, I went to look around the community and loved what I saw,” said Erica Wilson, owner of Clear Speech, LLC. Clear Speech’s vision is to help children, adolescents and adults receive high-quality therapy services in an atmosphere full of hope, professionalism and compassion. “We are committed to getting results and making a true and lasting difference in the lives of our patients and families,” said Erica. The company has steadily grown in the past six years from a 400 square foot facility to a 1,400 square foot facility with a full sensory gym. Clear Speech has multiple speech therapists on staff with over 30 years of experience providing therapy services. The company also provides Interactive Metronome (a brain training program that improves memory, attention skills and processing skills). The company has built a network of pediatricians, ENT specialty physicians, and other doctors in the area, and they accept all forms of insurance. For more information about Clear Speech, LLC, please visit www.clearspeechllc.com or call 404.202.8490. See All The Businesses at Wall Street Conyers! Stop for a moment and take a look around. Walk outside and breathe in the fresh air, take time to literally smell the flowers and grab some Vitamin D on a sunny day. In today’s world, we seem to be connected to our offices almost 24/7, so it’s important to have a welcoming environment outside, as well as inside. Being outside is important to everyday living, and landscaping not only affects your employees’ well being, but it also affects your business’ productivity. In a survey by Quantum Workplace the number one way employers can use their location to increase employee engagement, and even recruit top talent, is adding outdoor workspace. Breathing in fresh air is great and highly beneficial for employees and employers. Encouraging employees to venture off for a brief 10-minute walk outdoors every day can help them clear their mind and then get back on track for the rest of the day. At Wall Street Conyers, outdoor space is an inviting amenity. 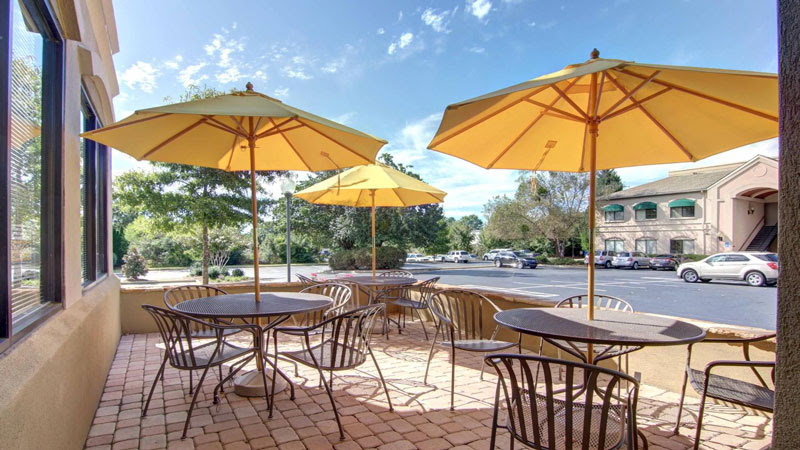 There are plenty of areas to sit outdoors to eat, meet and relax, all with a beautifully landscaped view. When the weather is nice, it gets very busy outdoors, with people walking, eating lunch, working with their iPads or laptops, and talking. Teachers from Peachtree Academy also come over to grab some fresh air on their breaks and enjoy the flowers. So, what are you waiting for? Go outside, kick back and rejuvenate in Conyer’s beautiful outdoors! Conyers, GA is the Place to be! Conyers, Georgia is known for being a one of a kind: for starters it’s the only city in Rockdale County! Now that doesn’t mean it’s in the middle of nowhere. Conyers is a mere 20-minute hop-and-a-skip to downtown Atlanta. With a thriving population of 15,000 and growing, Conyers is the blissful oasis within a stones throw of a thriving metropolis. Conyers may be a smaller city, but its history is extensive. Historians are able to trace human civilization back thousands of years, from Native Americans to the first white settlers to The Dukes of Hazzard filming in the 1970’s. Most notably, Conyers was host to the equestrian and mountain biking events in the 1996 Atlanta Summer Olympics. For a taste of days bygone, visit Conyers Olde Town, characterized by a colorful main street and a residential neighborhood with many of the houses listed on the National Register of Historic Places. Conyers may have a fascinating history, but that doesn’t hold a candle to its promising future. Conyers is a fast expanding city with a population of 15,000 and growing. This makes Conyers a great place to start or expand your business. Wall Street Conyers is the place to be if you’re looking for a flexible, accommodating office space with all the comforts of the home. These modern condominium style office buildings offer the feel of a home with the amenities of a business. Office space ranges from 450 square feet to 15,000 square feet, allowing the space to accommodate any sized business from a solo entrepreneur to a fully established firm. Interested parties can mix and match office suites to create their perfect floor plan. Wall Street Conyers offers plenty of parking to accommodate your customers and clients, as well as being in the heart of a community shopping center. The offices are located right where everyone is running their mid-day errands; close to banks, supermarkets, shopping and restaurants. It’s convenient and visible for people to come to your office and for you to get your to-do list done during your lunch break! If you’re dreading the paperwork and bureaucracy that comes with moving to a new space, fear no more. Hand-selected vendors and service providers expedite the moving in process so all your business has to handle is the fees. In addition to all of that, high-speed Internet access on site makes the transition even smoother. Check out Wall Street Conyers today and get ready to get acquainted with your new office space! Your Move in Checklist! 15 tips to make your move to Wall Street Conyers easier. Wall Street Conyers has the space to suit your needs, the service to accommodate your business and the support to ensure your satisfaction. Our office spaces can suit everyone from the solo entrepreneur to a robust company bringing on new employees. Our newly renovated, centrally located buildings offer square footage between 450 and 15,000 feet. We can combine suites to suit your current needs or change as your business develops. 1) Printed contracts for all parties involved. Landlord, Movers, etc. 2) Keys for storage unit, new and old office. Extra car keys in case you lose a set or get locked out. 3) Phone numbers of all parties involved in move. 4) Portable charging device since iPhones don’t run on good intentions. 5) Cash to tip movers and/or gift cards for their lunch. 6) Printed directions. If you forget to charge your phone, you’ll need another way to navigate. 7) Plenty of duct tape, black Sharpies and trash bags. 8) Ensure document shredding company knows your new location. 9) Label all cords before unplugging them. Bread ties work well. 10) Claim new address on Google+ Local as soon as you know it. 11) Schedule an email to clients letting them know of your move, or add a tagline to all correspondence that has “We’ve Moved” or “New location” in bold with details. 12) Label all boxes with a number and post a sign with that number in the corresponding room/area where box needs to be placed at new location. 13) List all box numbers with a short description of what was in each box in case a box goes missing. 14) Take pictures on your phone of expensive equipment just prior to your move just in case it gets damaged. Smart phones will time stamp each picture. Wall Street Conyers is within walking distance of restaurants, banking, retail and residential communities, providing convenience to employees and clients alike. We hope you will visit us soon to see available space. Wall Street Conyers is located 20 miles east of Atlanta and Hartsfield-Jackson International Airport. Moving is anything but painful when you utilize our network of handpicked, pre-screened vendors and service providers. Best of all, we recognize each tenant is unique and offer custom leasing options whether you plan on settling in at Wall Street Conyers or want to keep your terms flexible.